As of Wednesday September 21st at 2pm EST, the following links should go active at our (finally official) Digital Store! Announcing the House of Secrets… Digital Storefront! Bird? No! Plane? No! 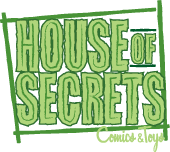 It’s the House of Secrets Digital Storefront! We just got it up and running and thought it’d be fun to take it out for a spin, so we made this little tutorial, wherein Paul Grimshaw, Store Owner Extraordinaire (and self-proclaimed Luddite) buys his very first digital comic. He’s written here before supporting them in theory, so we thought we’d put his technological tolerance to the test. I think it went well! The good people over at Comixology (who are pretty awesome, I think) have made available to us (and other Fine Retail Establishments) a pretty amazing option. They’ve been selling digital comics for a while now, and we know many people, including some of you, our beloved regulars, are taking advantage of that availability. And we think it’s great! It’s already helping us out; the other week I was chatting with a customer who bought the most recent issue of Mark Waid’s “Irredeemable,” and he mentioned that he had stopped reading it a while back when he got behind. Then, on a business trip the previous week, he got a hankering… one downloading-and-reading-on-the-plane binge later, and he was caught up, hooked all over again, and eager to buy the next single issue. So that’s a buck or two we got from digital comics before we even had a way to sell them ourselves. And now we can do both! Please let us know what you think and how you like it; we get the design and content directly from comixology, but they’ve encouraged us to pass feedback on to their team. Q: Do you guys determine what shows up in the store? A: Right now, no. Everything you can buy through comixology is available through our version of their storefront, though, so we’ll get new content as fast as they can put it up. Q: What’s the difference between buying a comic here and buying it at the comixology site or from a mobile app? A: The difference is that when you purchase something through our site, part of your purchase price goes to the House of Secrets! How great is that? (It’s a little like one of your favorite sites being an Amazon affiliate, but for now it’s only available to us Dead-Tree-Edition Retailers). Q: Speaking of apps and iPads and such, can I access your site that way? A: Yes and no: you CAN read your comics on your iPad, iPhone, iShoePhone, etc. You need to be able to access comixology (which means an internet connection) to get to your collection, but otherwise your collection goes wherever you do. You CAN’T, however, buy comics through the House of Secrets portal without pointing your browser at it, and it’s currently Flash-based, which means no joy on iOS. Comixology is working on that. We could theoretically try to build our own app, but (a) we’re not 100% sure how to do that and (b) we’re not sure its worth cluttering your desktop with another app just for this. If we’re wrong and you would love that, let us know, and we’ll make it up as we go look into what that would take. Q: Can I get my House of Secrets discount on items from the digital store? THANK YOU, as always, for your support. We were eager to get the digital storefront up and running mostly because you guys kept asking about it; it’s an honor and a privilege to have regulars like you all who love us enough to want to support us even with your Digital Dollars. Hold on, I’m getting all sniffly. SUPER SECRET EXCLUSIVE BONUS time! They came and covered our midnight shindig last week for the launch of the New 52, and they got a few words of wisdom from the man himself. Ooh, SUPER SECRET EXCLUSIVE BONUS time! Read a FREE ten-page preview of “Any Empire” on our brand-new, top-secret *CLASSIFIED*! And if you happen to notice anything while you’re there, enjoy your pre-release sneak peek at the CLASSIFIED section of our store. See, I don’t even know why you’re still reading, down here. That’s why I’m rewarding you with secret links. Look out for next week, when we actually make these announcements! And, er, let me know if anything’s broken, because I’d rather like it all to go smoothly. 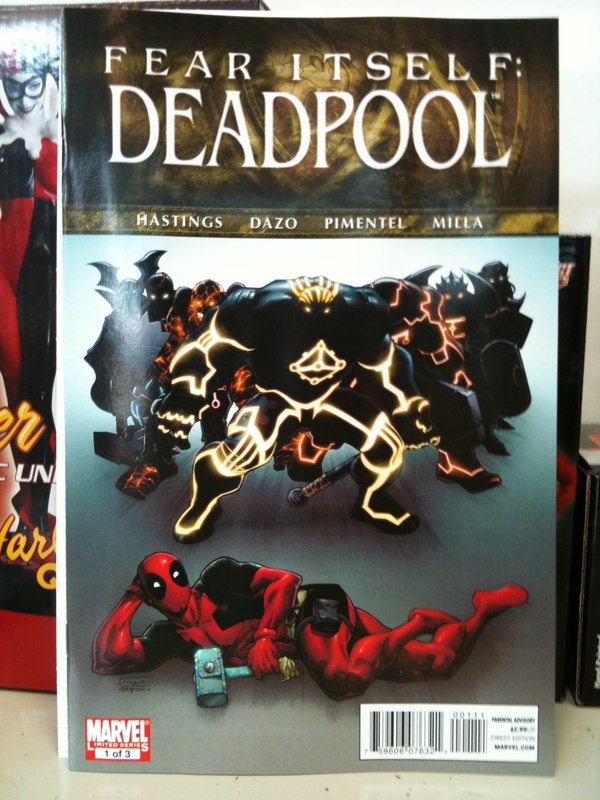 Dark Horse Giveth Again! Free Spike Comic, Anyone? I couldn’t resist cutting and pasting last month’s post a little, because what do I need to say besides the following? Spike is waiting for you! In a sense. The second Dark Horse Digital Retailer Exclusive is here! I’m writing as quickly as I can, because I promised myself I wouldn’t read it until I post about it. Pick up a coupon from the store (I know we’ve had at least one call about them already, so if that was you, please call again! We’re all set and ready to distribute). THINGS TO NOTE: we only have 100 codes to distribute. THE OTHER THING: You have to redeem them by the end of August! If you’re as bad with time as I am (SO BAD) this means you should HURRY and pick it up soon. See this week’s announcement on the Dark Horse blog for more info, or the original announcement from our generous friends at Dark Horse for the full scoop. Comics! Free! Limited time only! All Hail Dark Horse! Gaze into the terrifying future with me: a future filled with FREE DIGITAL COMICS! Yes, it’s true! 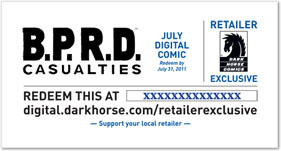 Until July 31st you can come to the House o’ Secrets and request your EXCLUSIVE code, good for one (1) totally free, super-badass BPRD story. 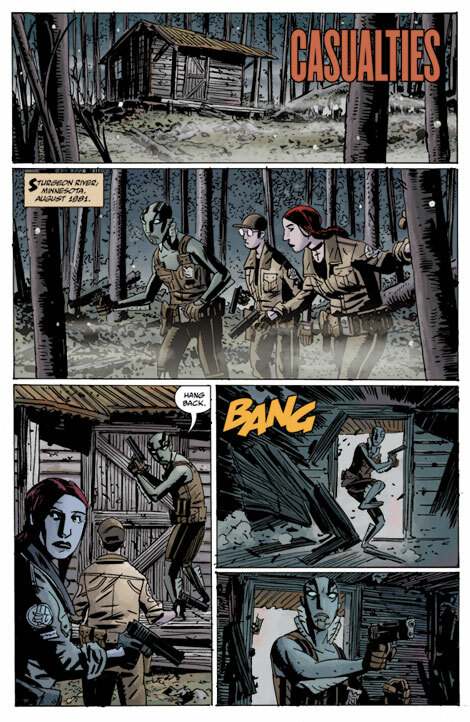 SEE the announcement from our generous friends at Dark Horse! GAZE at the cover of the comic you could soon be reading on your space-tablet-machines, absolutely free! HURRY, because we have a limited supply of codes, and also because you have to redeem them by the end of the month! 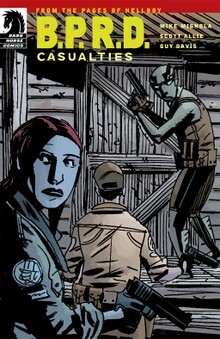 READ your delightful BPRD goodness! STAY TUNED! 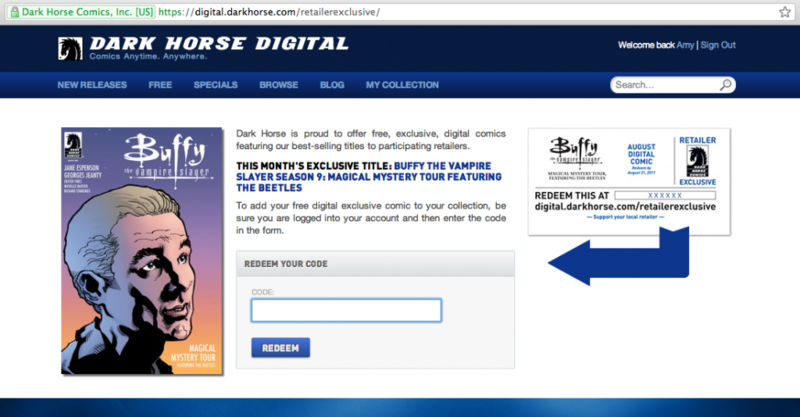 We’ll have more codes in the months to come, including, for August: a Buffy comic! Exclusive! Free! Please forgive me for the outrageous sideshow barker style. I’m just excited. If the world were going to end this fall, would you still read Flashpoint #3? we should only be reading books we would want to read even if the world were going to end this fall. Of course I understand the pain of investing so much of our lives into ongoing stories and then being denied the futures of those stories; that collective shared reality and the idea that these things will matter are major contributors to the power and distinctiveness of comics as a literary tradition. But this is our hard-earned money we’re talking about, and as grateful as we are that DC ignited the trend towards un-crazy-fying the price point (VERY GRATEFUL), even $2.99 really adds up. We should never be reading a book just because, a year from now, we’re going to need to know what happened in it. This is your chance, fanboys and girls! In the spirit of the upcoming holiday, declare your independence from the obligatory purchase list, and exercise your right to buy and read those comics and ONLY those comics which you specifically want to read. “If none of this mattered, would I still want to read this comic?” and if the answer is “No,” put it back. Life is too short and there are too many wonderful comics out there (addictive little buggers). Reward only the work that’s engaging you consistently; put your money where your mouth heart is, and as a bonus you’ll be doing your part to shape a better, more compelling comic book industry. 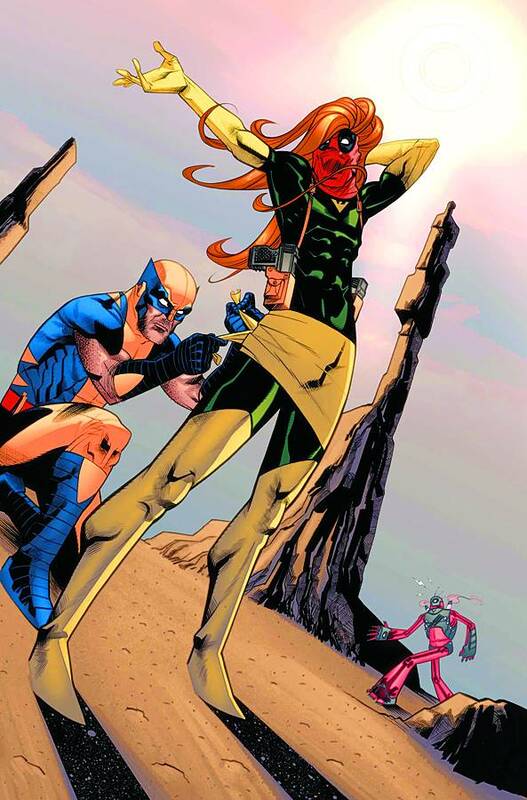 And if you’re curious: if the world were going to end this fall, would I still want to read Flashpoint #3? Are you kidding? Are you reading this storyline? That exchange between Wayne and Gordon in “Batman: Knight of Vengeance” #1? The surprisingly poignant “World of Flashpoint?” The awesome soap opera stylings of the Aquaman/Wonder Woman backstory? Are you, like me, a total sucker for alternate universe re-imaginings? 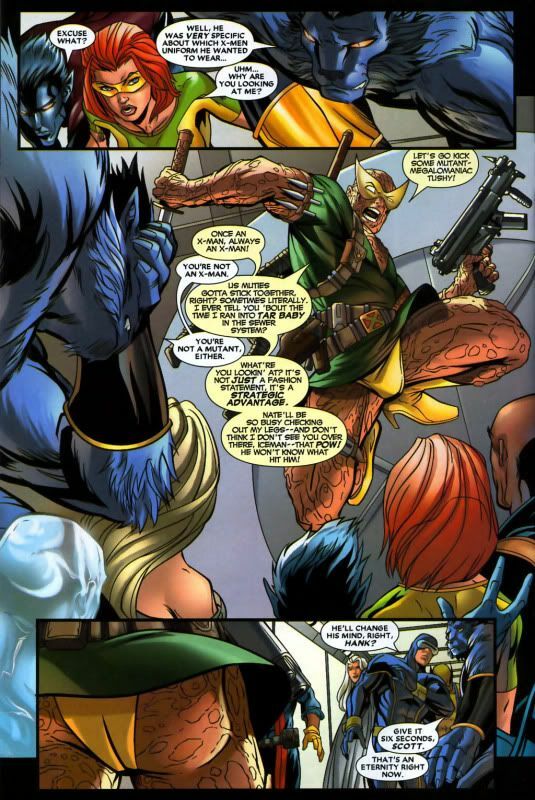 Without a doubt, my favorite thing about the Merc with a Mouth is his devotion to spotlighting the silliest tropes in comics.